Hog weights are clearly a critical factor in determining pork supply. While slaughter is the big number, variations in hog weights can mitigate or add to changes in slaughter and it is pounds of pork that ultimately impact the market. 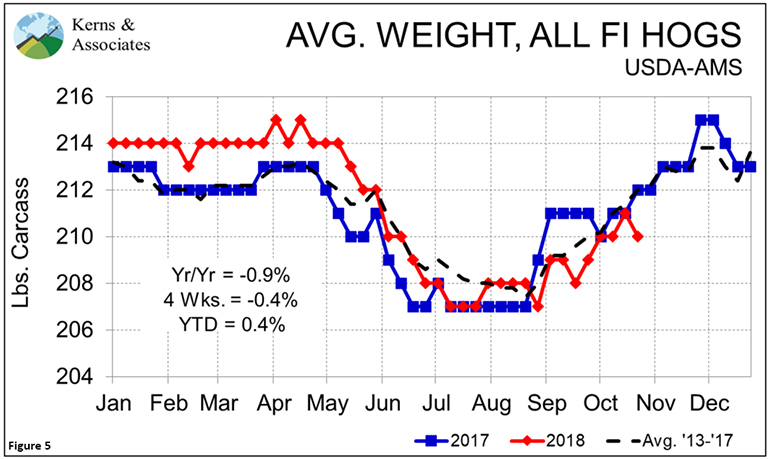 Average weight across all hogs is best to watch if one is trying to determine production or monitor how production might be impacted by slaughter changes. U.S. pork exports exceeded year-ago levels once again in September. That is likely a surprise to many given continuing trade tensions. September’s 146,532 metric tons brought the year-to-date total to 1.460 mmt, 5.6% more than one year ago. The year-on-year challenges are easy to guess: Mexico was down 8.6% and China/Hong Kong was down 33.5% from one year ago. This year’s shipments to Mexico are still 2.7% larger than last year. South Korea continues to be a stellar market for U.S. pork with September shipments exceeding year-ago levels by 21.4%. Year-to-date shipments to Korea are up 40.7%. The value of U.S. exports was down 3.5%, year-on-year, in September but remains slightly (3.1%) higher for the year. Pork variety meats continue to lag year-ago levels by a significant amount. 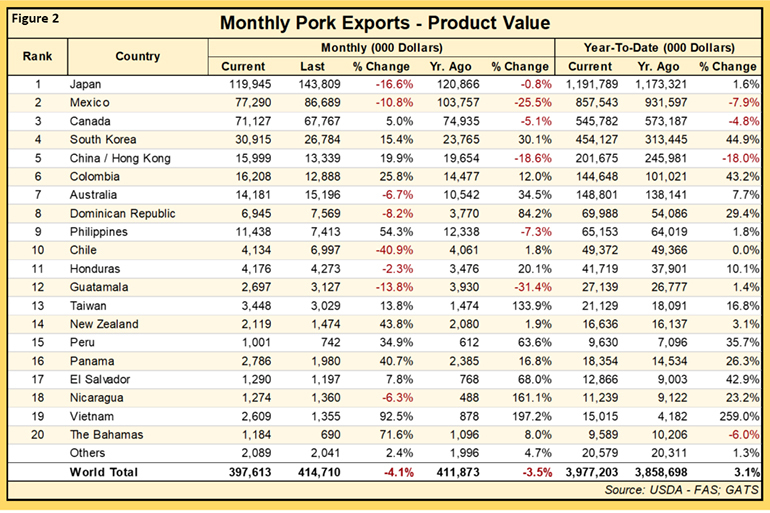 We need to remember that when we talk about pork variety meats, we really only talk about two markets that have historically taken 80%-plus of our exports: Mexico and China/Hong Kong. Shipments to those two markets were down 46% and 21.3% year-on-year, respectively, in September and they were still our largest two markets! The two have taken 30% and 12% less variety meats, respectively, this year than one year ago. Tariffs matter. Especially on low-priced product. 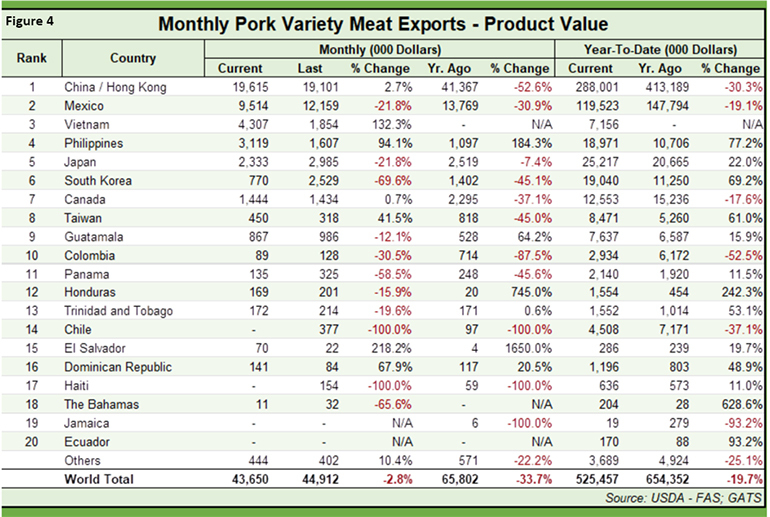 But there may be a silver lining: Shipments of pork variety meats to Vietnam and Philippines are up sharply this year. Lower prices due to less competition from the two giants is probably one reason but the good performance to Vietnam is likely due to some backdoor shipments into China. 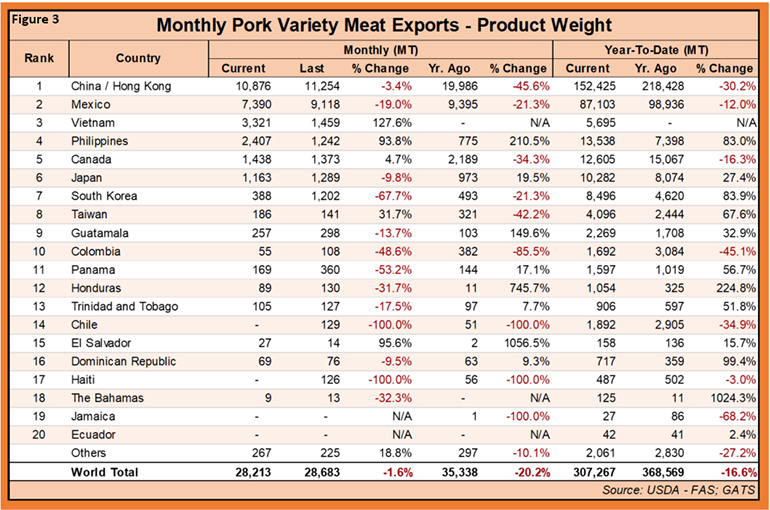 Pork variety meat export value was down by just over one-third, year-on-year in September and is down nearly 20% so far in 2018. Pork and pork variety meat exports have accounted for $42.27 for each hog slaughtered through September. 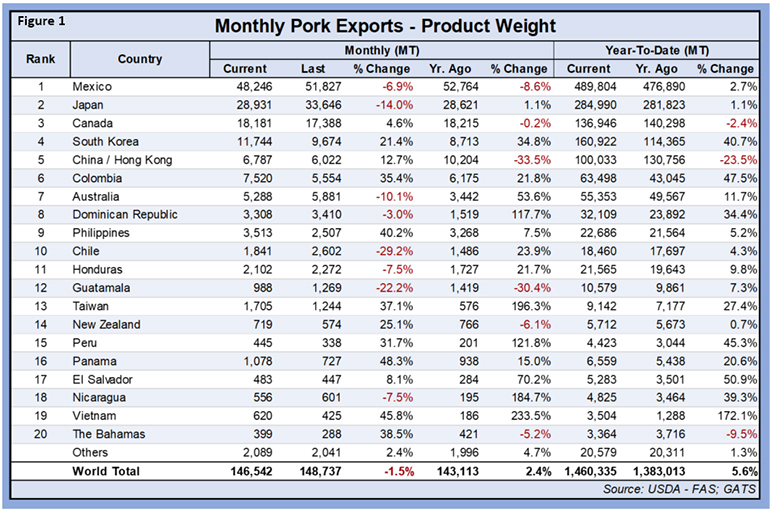 September data for product weight exports and export values for both pork and pork variety meats appear in Figures 1 through Figure 4. Perhaps more important, hog weights can tell us whether marketings are occurring in a timely manner, are being sped up or being slowed down. “Currentness” can be a critical factor in hog markets, especially in the fourth quarter. There are four primary hog weight series that we watch here at Kerns and Associates. Average carcass weight, all hogs and pigs under federal inspection. This weight comes from two USDA reports. The Estimated Weekly Meat Production Under Federal Inspection report (SJ_LS712) reports estimated weights for all hogs harvested each of the past two weeks. The Actual Slaughter Under Federal Inspection (SJ_LS711) reports the actual weights of hogs two weeks past and includes separate weights for all hogs, barrows and gilts, sows and boars. We watch the all-hogs weights from these two reports closely as they theoretically would be the link from total hog slaughter to total pork production. The estimates in the 712 report frequently get revised when the actual data of the 711 report are released. Both series are quoted only in whole numbers. These are voluntary reports. Packers do not have to report data. Average barrow and gilt live weights, Iowa-Minnesota. These are published weekly on Wednesday for the previous week in NW_LS720. They are published with numbers to one-tenth of a pound. This series is watched closely by all market participants as it has accurately portrayed the sizes of hogs moving to plants representing the lion’s share of U.S. capacity. This report, too, is based on voluntarily reported data. 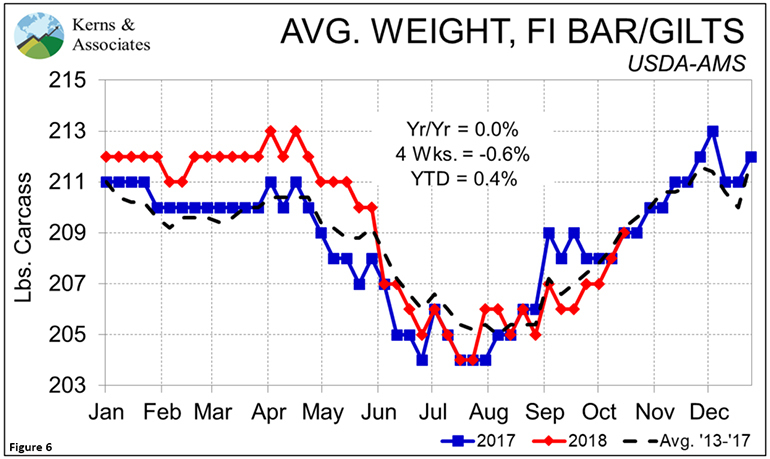 Average weight of producer-sold barrows and gilts. We watch weekly data, but these data are available daily in National Daily Direct Hog Prior Day Report — Slaughtered Swine (LM_HG201). The mandatory reporting system covers about 95% of all barrows and gilts slaughtered each day and the producer-sold portion represents 62-64% of the total. Packer-sold and packer-owned hogs make up the remainder. These data are available for each purchase type, but we use only the average across purchase types (i.e. the Totals per weighted average column of the first table in the report). Packers’ reported data are audited periodically by the Agricultural Marketing Service and packers can be fined if a “pattern” of reporting inaccurate data exists. 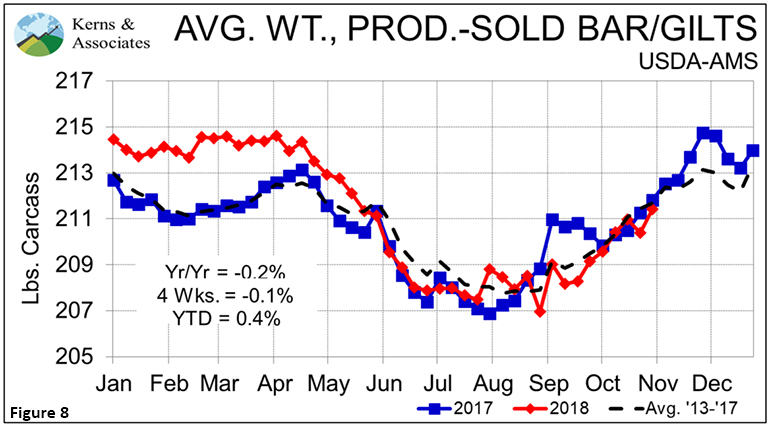 Note that these data plus average barrow and gilts weights from other mandatory price reporting reports are now available on a new AMS report, Weekly Average Weight of Barrows and Gilts. It can be found by clicking that name in the Regional Slaughter section at AMS.USDA.gov. So which weights should you watch and use? The universal answer of economics applies here: That depends. It depends on what you are watching and trying to discern. Obviously, the average weight across all hogs is the best if one is trying to determine production or monitor how production might be impacted by slaughter changes. 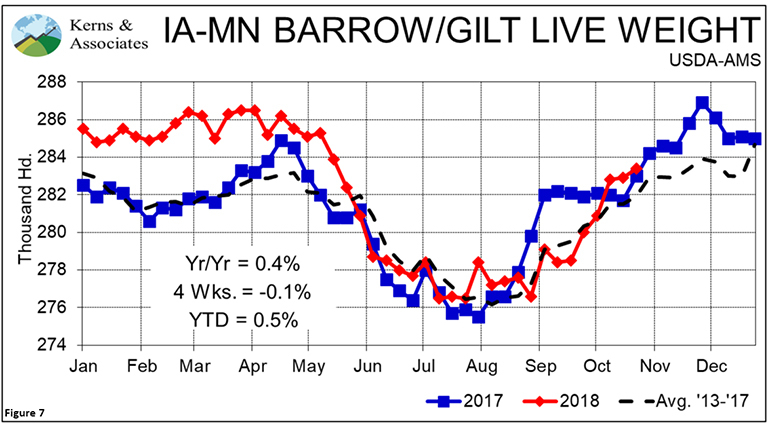 Barrow and gilt weights would be a better measure if marketing “currentness” is of interest, but the most recent data available will be two weeks old. That’s is a big delay when “currentness” is what you are interested in. Average live weights are useful, especially since they have the long-standing reputation of being accurate. They are relatively timely, coming out only five days after the end of the week in question. They do only represent hogs harvested in Iowa and Minnesota and, like the two weights in the previous paragraph, reporting is voluntary. Each week’s data may represent a different set of reporting packers. Weights of producer-sold barrows and gilts are, to us, the best for most market analysis and monitoring purposes. They can be watched daily if one wants. They are available for the prior week early on Monday morning. They represent a high percentage of the barrows and gilts harvested each day and, since they represent only producer-owned pigs, they remove the impact that any vertical integration motives might have on the data. Finally, reporting is mandatory, so all packers are represented each week and we now have historical data back to 2002. Charts of all four series showing this year, last year and the average of the past five years appear in Figures 5-8.